running residential camps. Also running and athletics event packages to join races from marathons, half-marathons and 10 km races worldwide. Epic Morocco are experts in tailor-made adventure travel and trekking holidays in the Atlas Mountains of Morocco, also mountain biking, horse riding, surf camps and marathon running training camps. Specialist marathon travel company for people who want a challenging race in a spectacular place! Like Everest Base Camp, the Malawi Marathon, Kenya Impact Marathon, or the Guatemala Marathon Base Camp or Summit Camp. Accommodation in Athlete's Villages with like minded people. Trail running and marathon training camps/holidays held on Dartmoor. The camps have been designed by the amazing Mountain Marathon Man – Carr, you've just got to read about his truly amazing Lands End to John O'Groats off-road run, but (thankfully) you don't have to run like that on his courses, which are suitable for all abilities! Two-day natural barefoot running workshops from Kirkby-in-Furness, a few miles south of the Lake District National Park. Learn the techniques of running barefoot or with minimalist shoes; the course will include video analysis, Alexander Technique and expert advice from qualified tutors. Guided running tours across Scotland amongst beautiful highland scenery, 5-day tours from Inverness to the Isle of Skye, with your luggage moved on for you between comfortable three-star hotels. New Zealand's first commercial trail running tour. An 8-day guided trail run on the South Island, taking in varied and beautiful landscapes that include three National Parks. Running will at a relaxed training pace and there will be regular breaks so runners can enjoy the landscape and take photographs. For runners of all abilities, trail and mountain running and training holidays in Andalucia. Prepare for road races, ultra events and high temperature/altitude races, or simply enjoy the freedom of the trails and roads in this beautiful area. Running holidays in the World's most beautiful wine regions, including Rioja (Spain) and Bordeaux (France) – perfect locations to improve your running and then reward yourself with delicious local wine and food. Offering a mix of leisurely runs and structured sessions, you'll go home feeling challenged, but also like you've had a holiday! Summer fitness camp for all, from serious athletes to keen novices. Run training includes hills, intervals and repeats, power walks, training and technique seminars, video analysis. Marathon racing in difficult environments in the UK and overseas, trips designed to push runners that little bit further. Sports tours and training camps for sporting groups in the Costa Del Sol, Spain. Guided trail running holidays in North Yorkshire, countryside running for new and experienced trail runners. Distance running breaks to races across Europe and further afield. A range of guided trail running holidays in the Lake District, Yorkshire Dales and the Costa Blanca Mountains in Spain. In the days before the race the tour will visit Beijing; and after the race there's a week of travel and sightseeing around Northern China, including: the Forbidden City, Tian'anmen Square, Terracotta Warriors and Shanghai. Combine adventure travel with an epic running race in stunning Himalayan mountain scenery. Join athletes from all over the globe, as well as local Nepali runners, for a choice from 10 km, 21 km or 42 km races. The idea is to fundraise for projects in Nepal and during this 7-day break there will also be visits to these projects. Accommodation will be in an Athletes Village on the edge of the Shivapuri National Park on the northern edge of the Kathmandu Valley. After the race on the sixth day there will be a party with bands. Adventure travel and trekking packages can be added to extend the trip. 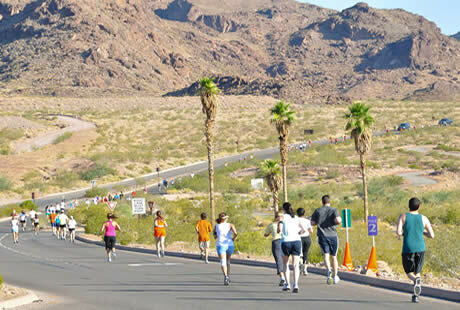 This section lists all things running on-road» and off-road», including: running camps and residential training courses; holidays and vacations for runners, including race training camps; race event packages (often including guaranteed race entry) for runners and spectators, to marathons, half marathons, 10 km and 5 km races; packages to attend athletics track and field events; mountain, fell and trail running holidays; mountain marathon training; and training camps for ultra events and desert training camps. Taking place in the UK, abroad in Europe, in the USA, Canada and Worldwide, and also including running weekends and short breaks away. TRAINING CAMPS: can be at a variety of levels so check out what's on offer; some are relaxed affairs, real runners holidays with, in addition to the runs, lots of rest and relaxation built in. While other training camps are full-on and really focused on the running, working hard on fitness levels and runners technique. 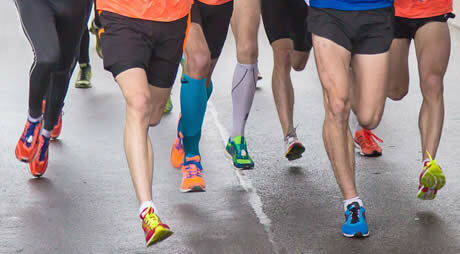 RUNNING EVENTS: combine taking part in a road race, be it a marathon, half or 10k, with a trip away. These may just cover the race itself, or may include additional days spent sightseeing or relaxing in the sun. Spectators, partners and family are generally also welcome on many trips. TRAIL & FELL RUNNING: an increasingly popular area which has the attraction of beautiful locations. A typical off-road running break will usually include a number of guided trail runs, some may also involve organised races and events in the hills. ULTRA EVENTS: ultra running events are a much more specialist area and might include double or triple marathons, triathlons, and ultra runs of more than 50,100 or even 200 miles, mountain marathons or desert races. see our Extreme Sports section» for more information on marathons, triathlons, iron man events etc. in difficult environments. The travel-quest athletics and running holidays section listing worldwide camps, courses and holidays for runners and athletes. See the definition at further up the page for more details.